My deepest condolences to the Hallquist family. Bj, Dan and Megan. You are such loving great children! Billy always spoke so proudly of you to me through the years. It is easy to see that his gentle spirit was passed down to you. Thank you for the care you gave to Billy throughout his illness and all the updates you provided me. I admire everything that you did! We lost a giant of a soul yesterday as I am sure everyone who ever had the good fortune of meeting and knowing Billy is feeling tonight and would agree. His contribution in bringing the Minnesota music community closer and raising awareness for Guitars For Vets is immeasurable. I am missing him dearly already and always will! Thank you also to everyone who gave here at GiveForward and all your loving support and get well wishes. I know they meant the world to Billy! Thank you, Billy for being such a great friend! I will treasure all the laughs, memories and great times we shared together. Definitely highlights of my life! The way you handled the last 9 months of your life and what you chose to do with your time was beyond dignified.The lessons you taught me on how to live I will carry with me all my remaining days on earth! You didn't need to be Elvis Presley's cousin for me to listen to you! Now the King has to make way for the Ambassador. Let him know if he wants a song to sing that you have plenty of great ones! Hallquist, Billy D. Age 65 of St. Paul passed away October 12th, 2015. Preceded in death by parents, Einar and Babe Hallquist; and two brothers- in-law, Bill Grevlos and Jim Lesney. Billy was a caring, generous, knowledgeable man with a thoughtful, reflective nature. His story proudly began in Sioux Falls, SD in 1949. He moved to Minneapolis and attended Nokomis Jr and Roosevelt Sr high schools where many life-long friendships developed. Billy's heartfelt love of music led to lasting friendships and experiences that had a profound impact on his life. 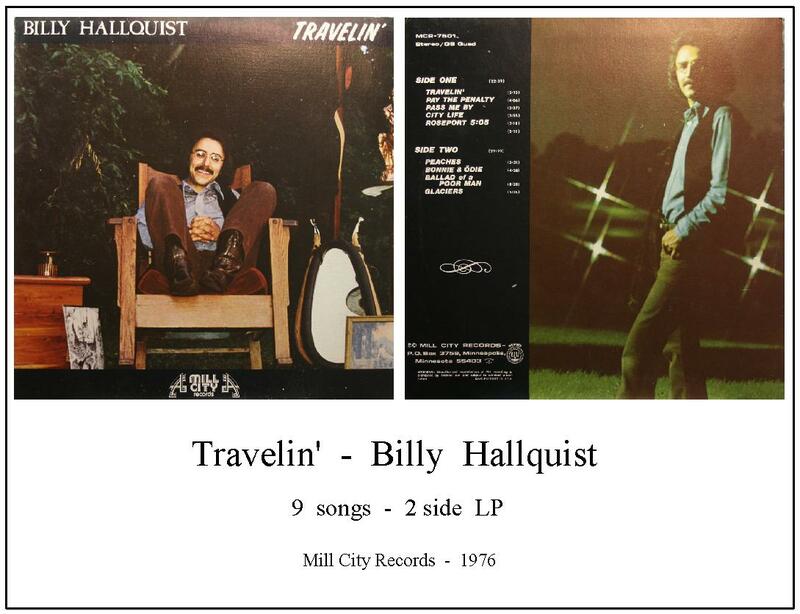 As both a singer and songwriter, Billy Hallquist's music career spanned 50 years. His ability to tell stories captivated friends and family. His storytelling through his music charmed audiences. The support received during his recent medical battle was a source of great relief and genuine appreciation. His family will be forever grateful. Billy is survived by sons, BJ Hallquist and Danny Hallquist; daughter, Megan Hallquist; and their mother, Michele Castello; sisters, Cheryl Grevlos, Darlene Lesney; nephews, Dann (Cindi) Grevlos, Dave (Lauraine) Grevlos, Mike (Lisa) Grevlos, Patrick (Tammi) Lesney; Nieces, Terry Lesney, Jill Grevlos Slagle (Jeremie Slagle); the Minnesota music community; many other relatives; and loyal friends. Billy's Life Celebration will be held on Saturday, Oct 24th 1:00 PM. An open house will follow with family present until 4:00 PM. Both events will occur at Lake Nokomis Lutheran Church 5011 31st Ave S., Mpls, 612-729-2323. A memorial fund currently being established. RIP, Billy Hallquist. He was a journeyman Twin Cities singer-songwriter with a big heart and generous spirit who helped raise tens of thousands of dollars for Guitars for Vets. 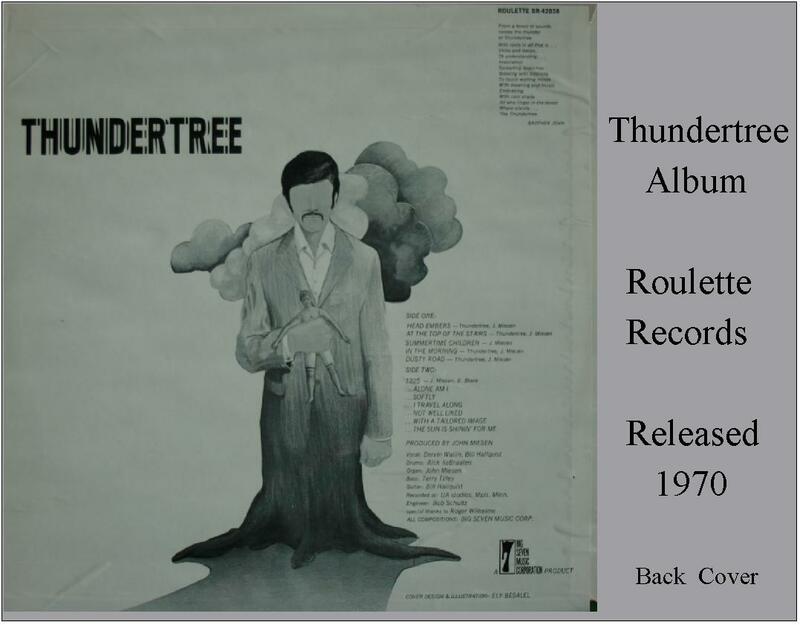 Coming from the same Minneapolis 1960's scene which spawned bands like The Litter, Thundertree evolved from garage band The Good Idea. In 1970 they released their sole album for the Roulette label: a perfect example of the transition from psychedelia to hard-rock and early progressive sounds. Killer fuzzed-out guitar, organ, and powerful vocals. Including hard-psychedelic classics like "In The Morning" and "At The Top Of The Stairs" along with the monstrous 17-minute long "1225" suite. 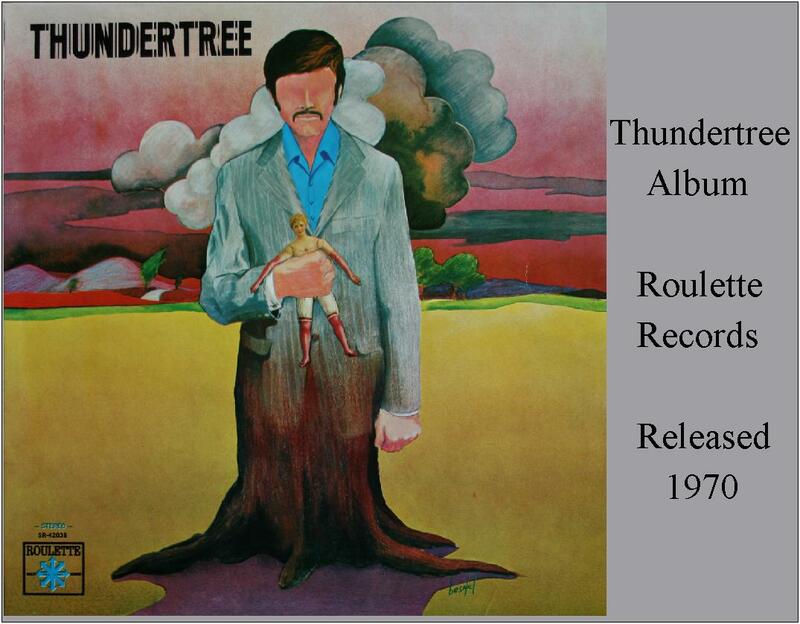 For this, the first-ever legitimate CD reissue of Thundertree, Riverman Music (Korea BTR0116) has included two previously-unreleased bonus tracks: "Pepper Palace" (a great psychedelic number) plus a storming cover of "16 Tons," which was the signature song in Thundertree's live shows. Both tracks were recorded at UA Studios, Minneapolis, Minnesota in 1970. Includes an insert with detailed liner notes by Billy Hallquist (Thundertree, Persephone, Travelin') with 24-Bit Remastered sound. Title: If this ain't the time / Phil Little ; (performed by) Connie Brown (i.e. Conradine Louis Brown). Pass me by / Billy Hallquist ; (performed by) Connie Brown. Imprint: (s.l. ): Amber Productions S80-1635, c1979. * Description: 1 sound disc: 45 rpm, stereo. ; 7 inch. Authorship on Application: performance & recording: Conradine Louis Brown d.b.a. Amber Productions, employer for hire. This project was to create a musical resume for piano and singing gigs.